The Sixth Avenue Bridge (Structure No. 1600-012) carries County Route 652 over the Passaic River connecting the City of Paterson with the Borough of Prospect Park and intersecting a portion of the Borough of Hawthorne in Passaic County. The bridge is a temporary structure that has been in place for 30 years, which is beyond the typical temporary time period. The Sixth Avenue Bridge is the main crossing from Paterson to points west, including William Paterson University and the Passaic County Vocational & Technical High School. The bridge is an important connection between the mostly industrial Bunker Hill section of Paterson and the industrial section of Hawthorne. The open-grid steel deck is not bicycle friendly nor is it wide enough for a shared bicycle lane. Trucks account for approximately 8% of the traffic volume over the bridge. As the bridge serves many varied interests, the LCD Study process is designed to enable full public participation. Future plans for the Sixth Avenue Bridge will be presented to the public so that the community’s voices are heard. 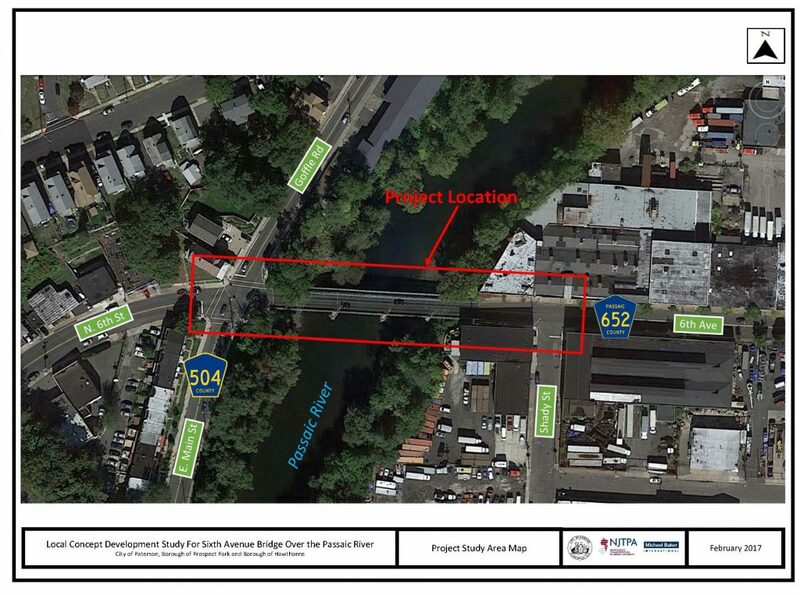 During the LCD Study, the Project Team will coordinate with representatives from the NJDOT, Federal Highway Administration, Passaic County, City of Paterson, Borough of Prospect Park, Borough of Hawthorne and other stakeholders. Existing Conditions: The Project Team will gather data from the Sixth Avenue Bridge area including traffic conditions, crash data, local demographics, and environmental information to inform the LCD Study, in order to inform future recommendations.